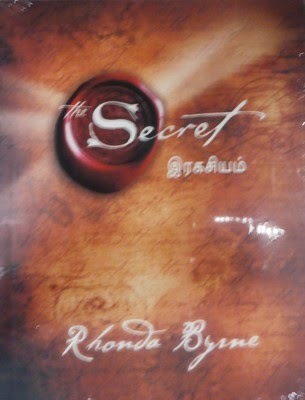 The Secret (Tamil) is a best-selling book from the self-improvement genre. This edition has been translated into Tamil. The Secret (Tamil emphasizes on the law of attraction and positive thinking can alter your life drastically for the better. The author asserts that this law of attraction governs the entire universe. The things and people that come into your life are attracted by the nature of the frequency of your subconscious thoughts. Negative thoughts, even at a subconscious level can attract negative events, and positive thoughts can have positive effects. Changing your state of mind can lead to more wealth, better health, and large amount of success. By implementing the steps and advice mentioned in the book, the author believes that one can achieve success faster and exponentially. By combining positive thoughts with maximum visualization, one can turn his or her life around for the better. The author also emphasises on gratitude that gives off a positive frequency, which in turn attracts all good things. The more you think about it, the more you believe it, the more accessible it will be to you. The author also advises to let go of the past, since emotional baggage only makes you view the world with an unknowingly negative and aggressive manner. The Secret (Tamil) asserts that anything you can dream of, you can achieve, simply by implementing the principles mentioned in the book. The author was majorly influenced by The Science of Getting Rich, a book by Wallace Wattles. The Secret was first published in 2006 which has sold over 19 million copies worldwide, and has been translated into over 46 languages. Rhonda Byrne, born in 1945, is an Australian author and television producer and writer. Byrne has written several books in the self-help genre, namely The Magic, The Secret Daily Teachings, and The Power. Byrne embarked upon her career as a radio producer before foraying into television production. Her vast experience in this field was instrumental in the making of The Secret film. She was featured in Time Magazine's list of 100 people who shape the world in 2007, and also in the Forbes’ The Celebrity 100 List. She was also a guest on The Oprah Winfrey Show, which led to great commercial success. She currently resides outside of Los Angeles.